The Ricoh GR II is a new premium compact camera that's aimed squarely at the enthusiast photographer. At the heart of the Ricoh GR II is an APS-C-size CMOS image sensor with approximately 16.2 effective megapixels and no anti-aliasing filter, and a 28mm fixed focal length lens which has a fast maximum aperture of f/2.8, a nine-blade diaphragm and a manually adjustable ND (neutral density) filter. Images can be recorded either as JPEGs or in the Adobe DNG RAW format, there's a pop-up flash and an external hotshoe which can accept a flashgun or an optional optical viewfinder, and full creative control over exposure is available. New features include Wi-Fi and NFC connectivity, an improved white balance algorithm, enhanced noise management, six more effect modes and wireless flash support. Thanks to the GR ENGINE V imaging engine, the GR II offers high-sensitivity shooting at up to ISO 25600, plus it can focus in 0.2 seconds and offers 4fps burst shooting. The Ricoh GR II is available in black for £599.99 / $799. Two external viewfinders, the 28mm GV-1 and the 21/28mm GV-2, are both offered as an optional accessory for £220 / $219. 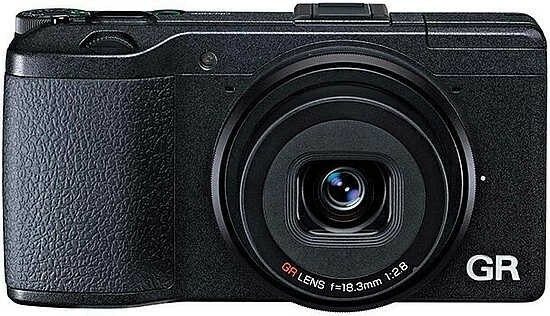 The Ricoh GR II is a wide and fairly slim compact digital camera that just about fits into the palm of average sized hands, measuring 111.7 mm (W) x 61 mm (H) x 34.7 mm (D) and weighing around 215g without the battery or memory card fitted. Utilizing a magnesium alloy body, the GR II is an exceedingly well built camera, and certainly up there with the best that the other manufacturers have to offer. Our review sample has an under-stated, all-black appearance which lends the camera a professional, no-nonsense feel. 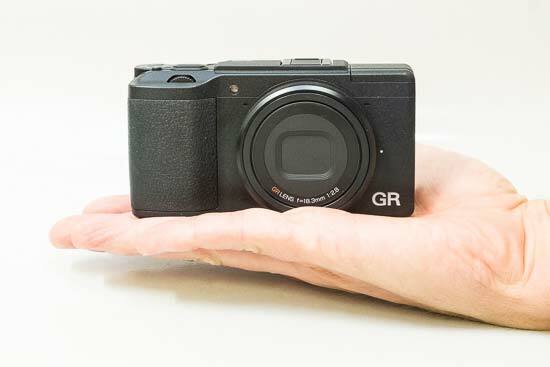 Despite its small dimensions, the Ricoh GR II has a large rubberized handgrip that allows you to get a really good grip, and there's a substantial area of the same material acting as a thumb rest on the rear and right-hand side of the body. The all-metal, central tripod mount is another giveaway sign that this is intended to be a serious camera (most compacts have a plastic mount squeezed into one of the corners). The GR II features a 28mm, f2.8 wide-angle fixed-focus lens, which will immediately put a lot of people off this camera. The GR II's 28mm lens is perfect, however, for wide-angle shots, so if you're a fan of land- and city- scapes, or you're happy to get up close and personal, the combination of the GR II's lens and every photographer's constant companion, their legs, proves to be more versatile than you might first think. 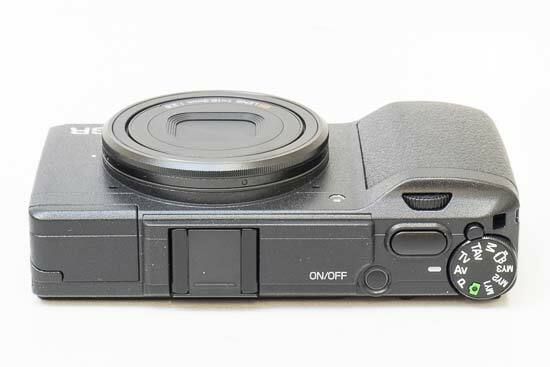 Ricoh have also included 35mm and 47mm crop modes, which as the names suggests changes the focal length to a a more classic 35mm or 47mm by cropping into the 16 megapixel image, producing a 10.2 megapixel photo and 5.7 megapixel photo respectively. Also, the optional GW-3 Wide Conversion Lens (£190) can be fitted to the GR II to provide a 21mm focal length. The Ricoh GR II has a maximum ISO speed of 12800. Cleverly you can also set a specific shutter speed in Auto High ISO mode as well as setting the upper limit of the ISO sensitivity. Note that, like its predecessor, the Ricoh GR II doesn't feature image stabilisation. The GR II offers Full HD movie recording at 30/25/24fps in the H.264 video format with stereo sound. During recording the camera can be set to continuously focus on the centre of the frame (manual, smap and infinity focus options are also available). Various image Effects including Retro and Bleach Bypass are available during movie recording, and the white balance can also be set. You can't set the aperture or shutter speed though, so you'll have to rely on the camera's exposure system when shooting video. The Ricoh GR II features a 16 megapixel, APS-C-size CMOS image sensor an Anti-aliasing filter-less design, which promises fantastic image quality for a compact camera - you can judge for yourself on the Image Quality and Sample Images pages. There's the usual choice of Fine and Normal JPEGs, but Ricoh have stolen a march on some of their competition by providing a RAW mode setting. Even better, the RAW format that they have chosen is not a proprietary one, but Adobe's DNG format, which means that the Ricoh GR II's files are instantly available in any RAW software that supports DNG (virtually every one). This is an excellent choice by Ricoh. There are four external controls which form the creative heart of the GR II. 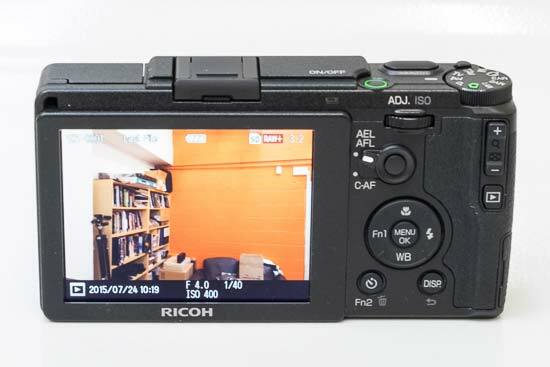 Located on the top right of the camera are the Shooting Mode dial, the front command dial and what Ricoh refer to as the Up-Down dial, and on the back is the ADJ. dial. These controls allow you to choose which shooting mode you want to use, with a choice of full auto, program shift, aperture-priority, shutter-priority, shutter/aperture-priority (TAv) (borrowed from Pentax DSLR camera, this mode automatically sets the optimum ISO speed based on the shutter speed and aperture) and fully manual, and to control the settings of the particular mode that you have picked. Continuing the customisation theme, you can configure the Ricoh GR II and save the current settings as one of three My Settings modes, which are accessible by setting the Shooting Mode dial to either the MY1, MY2 or MY3 option. This allows you to configure the GR II for different uses and allows quick access to each configuration (the camera remembers the settings when it's turned off). The two Function (Fn) buttons on the rear of the camera and the Effect button on the side can also be customised to suit your particular needs. The Ricoh GR II is one of the most customisable compact cameras that we've ever reviewed. The new Wi-Fi function lets you use your smartphone to change the Ricoh GR II's key settings and even fire the shutter button remotely (including video recording) using the GR Remote application, while Image Sync automatically backs up your photos onto a mobile device or computer. The GR II now also features NFC (Near Field Communication) technology (the same technology that's used for mobile payments), which allows you to connect it to a compatible internet enabled device or another NFC-enabled camera by simply tapping them together. As the Ricoh GR II offers a full range of advanced exposure controls, it's quite complex in terms of its design. There are 20 external controls in total, leaving just enough room for the 3 inch, 3:2 aspect ratio LCD screen on the back of the camera. Further appealing to the avid photographer in you, the Ricoh GR II has a range of focusing and metering modes that should cover most situations. On the focusing side, the multi-AF system has 9 separate auto focus points, and there's also Spot AF, Pinpoint AF, Subject Tracking, Manual focus, Snap mode (can be changed to focus at either 1m, 1.5m, 2.5m, 5m or Infinity) and Infinity. The AF function button/lever on the rear of the camera toggles between AEL/AFL and the Continuous AF (C-AF) mode. When it's set to the latter, if you hold down the AF function button to focus on a moving subject and press the shutter release button at the same time, a series of sharp images of the subject is taken. Alternatively, the continuous shooting mode ican be automatically activated while the C-AF button is pressed. Multi-pattern auto white balance is useful for scenes with mixed lighting - daylight and flash, or fluorescent and daylight, for example. Instead of just taking an average reading from the whole scene, which inevitably gets the white balance wrong for the secondary light source, the GR II breaks the image down into small areas and analyzes and sets the white balance for each one. In practice it produces a subtle but noticeable effect that is particularly useful for capturing more natural portraits when using flash. New to the GR II is the Color Temperature Extension white balance mode, which makes it possible to emphasize a predominant color within the image, such as the red in sunset scenes. Also very useful is the ability to change the power of the built-in flash which can be set at 12 levels from full flash to 1/64, enabling you to balance the intensity for both the subject and background. The GR II also now offers wireless flash functionality. The built-in flash can be used to trigger external Pentax flashes as a slave, including the AF540FGZ II, AF360FGZ II, AF540FGZ and AF360FGZ flashguns. The Ricoh GR II's 3 inch, 1.23 million dot LCD screen is a real highlight. Both text and images really come alive on a simply breath-taking display that's one of the best of any camera that we've ever reviewed. It also has an automatic brightness adjustment function which as the name suggests automatically matches the screen's brightness to your surroundings. If you don't like composing your photos by holding the camera at arms length and looking at the LCD screen, there's also another way of framing your shots. You can additionally buy an optional, completely removable optical viewfinder. The OVF slots into the hot-shoe on top of the camera, allowing you to hold the camera up to your eye and instantly giving the GR II the feel of a single-lens reflex camera. The Dynamic Range Compensation mode records images with greater dynamic range. When the Ricoh GR II is in DR mode it takes a single shot and attempts to expand the dynamic range. There are three DR strengths - Weak, Medium and Strong - and an Auto setting. You can also choose to bracket this feature too. The Depth of field indicator is an equally useful function. If you set the GR II to either Manual or Aperture priority mode, and the Focus mode to Snap, Manual or Infinity, a vertical scale on the left of the LCD screen indicates the depth-of-field at the current aperture, helping to ensure sharp focus when you're not relying on the camera's auto-focus system. The main menu system on the Ricoh GR II is straight-forward to use and is accessed by pressing the Menu/OK button in the middle of the navigation pad. There are three main menus, Shooting, Key Custom Options and Setup. Quite a lot of the camera's main options, such as image size, sharpness, metering mode and continuous mode, are accessed here, so the Shooting Settings menu has 30 options spread over 3 screens, the Key Custom Options menu has 27 options, and the Setup menu has 40 options. Due to the high-resolution LCD screen and restricting the number of on-screen choices to 10, the various options and icons are clear and legible. 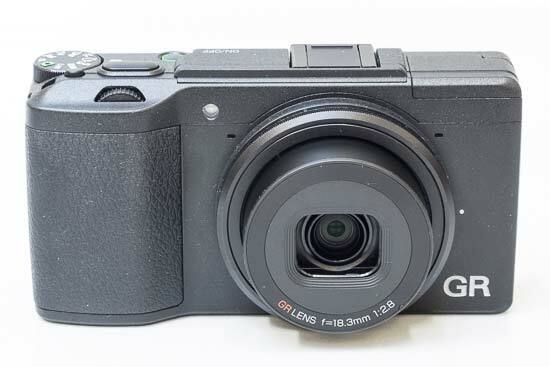 Ricoh are well known for delivering responsive cameras, and the GR II certainly continues in that tradition. The start-up time from turning the Ricoh GR II on to being ready to take a photo is responsive at around 1 second. Focusing is very quick in good light, with a focusing speed of 0.2 seconds, despite not using the older GR IV model's hybrid autofocus system. The camera also happily achieves focus most of the time indoors or in low-light situations, and macro focusing speed is pretty fast too at 0.4sec. It takes about 0.5 second to store a JPEG image, allowing you to keep shooting as they are being recorded onto the memory card, and there is virtually no LCD blackout between each image. Shooting in RAW mode, the GR II only takes around 1 second to store a RAW image, and you can also take another shot while it's being written to memory. In the fastest Continuous mode the camera takes 4 frames per second for an unlimited number of images at the highest JPEG image quality, which is very good for this class of camera. Even better news is that the GR II can also shoot up to 10 RAW images at 4fps. Using the Subject Tracking AF mode, while the shutter-release button is pressed the GR II takes a series of photos and adjusts its focus on the subject at the same time using the external autofocus system, which proves very useful for quick-moving subjects. Once you have captured a photo, the GR II has a good range of options when it comes to playing, reviewing and managing your images. You can instantly scroll through the images that you have taken, view thumbnails (81 onscreen at once! ), zoom in and out up to 16x magnification, view slideshows with audio, set the print order, delete, protect and resize an image. Level Compensation allows you to correct the contrast and tone of an image after it has been taken, White Balance Compensation the white balance, and Color Moire Compensation usefully removes any artificial color banding. The Skew Correction function alters any photo that was taken at an angle so it appears as if it were taken directly in front of you. There's even in-camera RAW Development, with 9 different parameters available.